Cooling off in the hot summer weather can be a challenge. Along with the arrival of the official first day of summer, areas in the metropolitan New York area, such as Long Island, have been hit full strength with a heat wave. Even the air conditioning has trouble cooling us off in a heat wave. There are ways to trick our bodies into feeling a bit cooler by decorating for the hot summer days. Staying cool often needs you to use your mind over matter. Just seeing heavy throws will make you feel hot; store away any wool and heavy knitted accessories for the summer months. Use soft cotton sheets and lightweight cotton quilts; cotton is a natural cooling fiber. Clean out your fireplace and place a lovely plant on display inside the hearth; memories of the heat of the fire will be replaced with a feeling of coolness that greenery will bring. Decorating with lovely fountains will create a peaceful, calmer, and invoke a cooler feeling abode. Running water naturally brings the mind and senses to a cool waterfall tricking the body into feeling a bit cooler. Place a free standing fountain in a larger space as if a centerpiece in an entry or as a room divider. 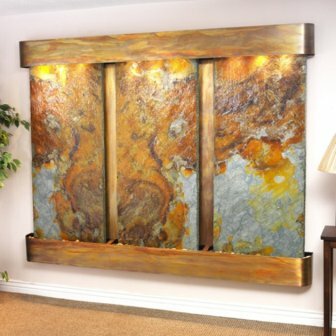 Wall fountains are flat and come in many sizes to fit any size upright space. They are true working works of wall art. 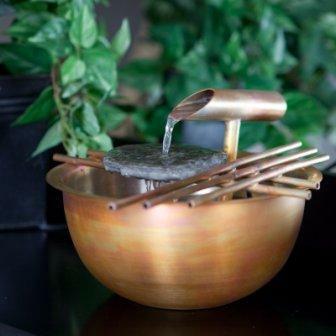 Tabletop fountains are perfect for smaller spaces. Many also work on batteries. Place one on a cocktail table as a pleasing conversation piece. As in the art of Feng Shui, the element of water is associated with the flow of money so it is especially powerful for wealth and career. 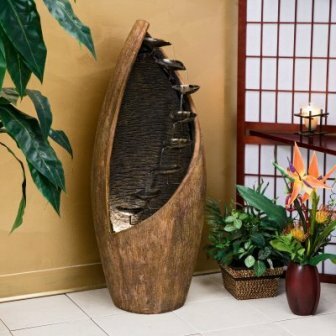 A decorative fountain serves double duty as an indoor humidifier and air purifier. The sound of the flowing water will cover up any outside noise and help with sleep and relaxation. The common necessities for a working fountain are a pump fed with tubing to bring the water to a fountain head that will pour into a reservoir. The fountain can then be dressed up to fit the décor that it will adorn. Metals such as copper, bronze, or stainless steel can be used as housing. Slate, stone, and concrete are wonderful for fountain surrounds. Fountains are also seen crafted using glass, ceramic, and plastic. Stones and pebbles can be placed in the fountain to create a natural feeling. Misters and lights can add additional ambience. Stay cool and enjoy the sounds of the water running in the fountain as you sit in the midst of the summer abode. Turn up the island music and never be afraid to dance!